Life is pockmarked with inexplicable turns of events, mind-boggling consequences to trivial occurrences, rude shifts in the currents that carry us, leaving us hapless as to the cause and the effects of being randomly flung hither and thither, despite working true to our heart and mind. As we lose ourselves in our aggressive demand for explanations, the best explanation ever concocted to assuage us is - “everything happens for the best.” We are consoled that there is a greater force, a much grander design in place, which channels the causes and effects, with the ultimate goal of working towards the greater good. Are these explanations merely to placate us humans tormenting ourselves with the need for a reason behind our tragedies? We have the innate drive to uncover the cause, or the reason behind everything. I’m always reminded of this nice example from the book, Sophie’s World. When a cat sees a ball come rolling from behind it, it jumps instinctively at the ball and happily plays with it. But if a human child (or adult) sees a ball come rolling, the instinct is to immediately look back and discern the cause - from where is the ball coming, who rolled it, etc. We constantly fit jigsaws of cause-effect puzzles in our mind, and can’t let go if the puzzle is unsolvable or incomplete. 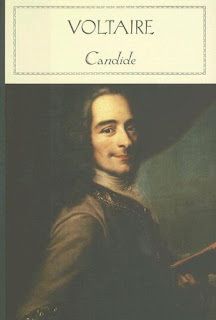 Candide is a satire that cynically scrutinizes the apparent randomness of our lives, and the die-hard conviction we hold, of faith and optimism, believing that everything happens for a reason, and that each of us will reap our share of good fortunes and lasting happiness. Candide is a young German man who was brought up by a wealthy Baron. When Candide and the Baron’s daughter are caught stealing a kiss, Candide is kicked out of the palace. This little unfortunate incident is the impetus that drives Candide to face a string of gruesome tragedies; his life was haphazardly catapulted from one misfortune to another, with interludes of kindness from beneficiaries who also invariably suffer. With the words of his wise master and philosopher, Pangloss, who reiterates that the Universe is the best possible design, and that every human misery and tragedy is for a greater reason to ultimately result in the best, he survives each hardship to attain his ultimate goal of rescuing and marrying his fair lady - Cunegonde (the Baron’s daughter). As much as hopes to find lasting happiness, his other philosopher-friend, Martin, argues that nobody in this world is truly happy, and that everyone in their heart will believe themselves to be wretched victims of the Universe tossed about in its random cruelty. Martin’s views are antithetical to Pangloss’s, as he proclaims there is no cause, effect, rhyme or reason for the journeys we take, and that there is nothing inherently “good” nor is there any “design” to the Universe. In a battle between these two opposing views, Candide represents the image of Innocence and Optimism, only to be progressively tarnished. The whole book is a parody of our lives, the medieval times, and its antiquated and barbaric social systems. While this book promises to be rich in philosophical debates, there are hardly any profound ones, for it’s after all a satire. The debates rage only within our mind, with the characters subtly stoking the embers. These debates have existed for centuries, but the answers lie only within our individual comprehension of the Universe and its ways. I only know that I hold onto the laws of cause and effect, for it helps me create meaning for myself. Like the majority, I need to convince myself that I exist for a reason, for a purpose, and that my experiences are worth something in a mysterious, intricate tapestry. Voltaire injects the notion, that regardless of there either being a grand design, or us being trapped in a storm of randomness, the quest for happiness is mostly an illusion, soon to fizzle away after achieving it. Ironically, no matter what our circumstances, we always seem to vacillate between feeling miserable for ourselves, or being bored with our event-less monotony. And the only way by which we engage ourselves to escape the strangles of boredom, desire and discontent is through channeling our energies and talents into hard-work. Rather than wonder what the Universe has in store for us, we contribute our share to the Universe, in our own little ways. This is Voltaire’s pragmatic “solution”, and I see a lot of truth to it. An idle mind is a devil’s workshop. An embittered mind, left to wander aimlessly is even greater a threat. This is the problem with most people these days. Their own minds are their demons. Despite the remarkable writing, the wise hints on morality and free-will, I can’t say I enjoyed the book. The tone of the book, with its intense satire, cynicism and extremely lurid and morbid tragedies, fatigued me. It was a “comedy” of errors and mishaps. The misfortunes were needlessly grisly, overemphasizing the satire and poking fun at the conviction that everything happens for the best with a higher reason behind. Man’s nature was shown in contrasts of good and evil - perhaps, a realistic version of our world spangled with virtues and vices in equal proportions, such that every act of good is nullified by an act of evil.. So where does that leave us? Just a little let down, but a little more accepting of reality, perhaps. This book is a tonic for the cynic, and a bitter dose of the reality pill for the idealist.